Releasing the sound of the heartbeat of God through revelatory writings. Donna Milham’s 2nd book – Can You Hear the Sound? is packed full of powerful writings, sure to move your heart closer to the heart of Father God. Can You Hear the Sound? is an invitation to journey into the depths and sounds of the eternal. Expect to encounter the depths of God’s heart, where you will discover the rhythms, the movements and the sounds of heaven. 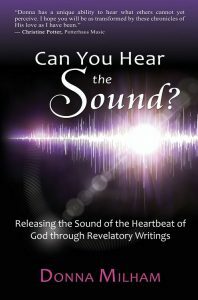 This book is an invitation to be transformed as you hear the sound of His breath, His roar of jealous love, His sounds of peace, His sounds of resurrection’s release and more. Experience transformation as Holy Spirit breathes and awakens your heart to venture Deeper into the realities of heaven being revealed on earth from intimate moments with the Eternal One.